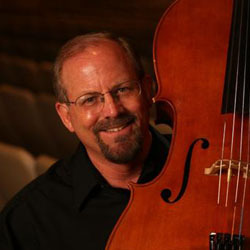 GARY HARDIE is Professor of Cello and Coordinator of Strings at the Baylor School of Music. His principal studies were with Joel Krosnick, who is currently Chairman of the cello faculty at Juilliard, and also with Charles Wendt. Other teachers include David Soyer, Luca di Cecco, and Hermann Busch. Before coming to Baylor, Dr. Hardie was solo cellist with the Center for New Music at the University of Iowa, and was on the faculty at New Mexico State University. Dr. Hardie is active as a recitalist and chamber musician, and has been principal cellist of several orchestras including the Waco Symphony and the El Paso Pro Musica Chamber Orchestra. He is currently cellist for both the Baylor String Quartet and Baylor Piano Trio. He has a keen interest in contemporary music and received a BMI Young Composer Award while in graduate school. His CD recording of Steven Stucky's Voyages for solo cello and wind ensemble, performed with the Baylor Wind Ensemble, was released on the Albany label in 1997 and received a first round nomination for a Grammy Award. Dr. Hardie’s cello students have won numerous honors, including being finalists in the Sphinx and San Antonio Tuesday Musical Club competitions, winner of the state ASTA Competition, and winners of the full concerto and concertino competitions at Baylor. His students have also received scholarships for summer study at the Kneisel Hall, Pacific Music Orchestra, Youth Orchestra of the Americas, Bowdoin, Round-Top, Brevard, Eastern, and Chautauqua Festivals. He is the founder of the Baylor Cello Choir, for which he has arranged numerous works. In 1997 Hardie received an Outstanding Tenured Professor Award from Baylor.